Jiangxi has great diversity of habitat and birdlife, although the provincial bird list as recently as 1996 numbered only 230 species. Po Yang lake is the key reserve, probably the most important winter birdwatching site in the whole of south-east China, and the prospect of Siberian Crane, White-naped Crane, Hooded Crane, Swinhoe’s Rail and Japanese Marsh Warbler should be enough to whet anyone’s appetite. Jiangxi has several other excellent sites as well as a number of rarely visited reserves so there are plenty of opportunities to trail blaze in this province. Key species found in the province include White-eared Night Heron, Scaly-sided Merganser, Siberian Crane, Hooded Crane, White-naped Crane, Oriental White Stork, Black Stork, Swan Goose, Lesser White-fronted Goose, Mandarin Duck, Swinhoe’s Rail, Elliot’s Pheasant, Cabot’s Tragopan, Pied Falconet, Swinhoe’s Minivet, Yellow-throated Laughingthrush, Short-tailed Parrotbill and Japanese Marsh Warbler. Most of these species occur at Po Yang. Great Bustard appears to have become locally extinct around Po Yang in the last five years which means that there is now no site left in south-east China to see this magnificent bird. The Jiangxi reserves book lists 59 reserves for the province although ‘A Biodiversity Review of China’ (MacKinnon et al. 1996) covers only 32 of these. Besides Po Yang Lake other major sites include Guanshan, Wuyuan, Julianshan and the Jiangxi portion of Wuyishan. 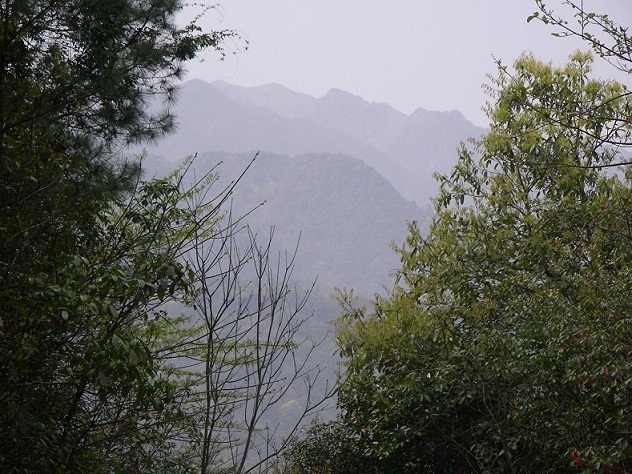 Like Hunan, Jiangxi is a basin bordered by mountainous areas, with an outflow in the north to the Yangtze river. The highest mountain is Nan Meng Xian, which peaks at 2120m. Flooding can be a problem in late summer in the north around the Yangtze. This province is north of the Nanling range in northern Guangdong and this spine of mountains running up along the border with Fujian effectively excludes the province from the ameliorating influence of warm winds from the South China Sea. Winters are much colder here than they are in Guangdong. The province supports a wide variety of habitat and vegetation. The lowest altitude forests are nearly all degraded now, but where still found are populated by Castanopsis, Machilus and Schima species, together with Cinnamomum campora, Phoebe nanmu and Cyclobalanopsis glauca. As might be expected, most of the coniferous forest these days consists of Pinus massonia and Cunninghamia lanceolata. However, Jiangxi also holds some of the most important stands of the rarer conifers including Cryptomeria fortunei, the Douglas Firs - Pseudotsuga gaussenii, P. chinensis and Southern Chinese Hemlock Tsuga chinensis. A little more widespread is Chinese Yew Taxus chinenis. In the more northerly latitudes, deciduous broadleaf forests including oaks, Quercus chenii, Q. acutissima, Q. fabri, Q. glandulifera, Q. aliena and several other species are dominant. Above 1200m or so the predominant woodland species are Rhododendron fortunei, R. simiarum, Enkianthus quinqueflorus, Sinarundinaria fanginana, Stephananadra chinensis, Symplocus paniculata and Camellia cordifolia. Bamboo forests are also widespread in the forest, the dominant species being Phyllostachys pubescens. Nanchang, the capital, has an airport that acts as a convenient entry point for many of the key sites, including Po Yang lake and Guan Shan. Three flights a week connect Hong Kong and Nanchang and, in addition, there is at least one flight a day from Shenzhen. There are other airports at Ganzhou (two flights a week from Guangzhou, Xiamen and Shanghai) and Jingdezhen close to Wuyuan. The recently constructed Beijing-Kowloon railway bisects the province from north to south and provides opportunities for reaching several other areas such as Jing Gang Shan relatively quickly. Jiangxi Provincial Nature Reserve Management Office, West Beijing Road, Nanchang 330046. Mr. Lin Jian Sheng: +86 138 0700 1872. Mr. Lin is familiar with most of the birding locations in northern Jiangxi, including Wuyuan and Yi Yang. He is an excellent guide.